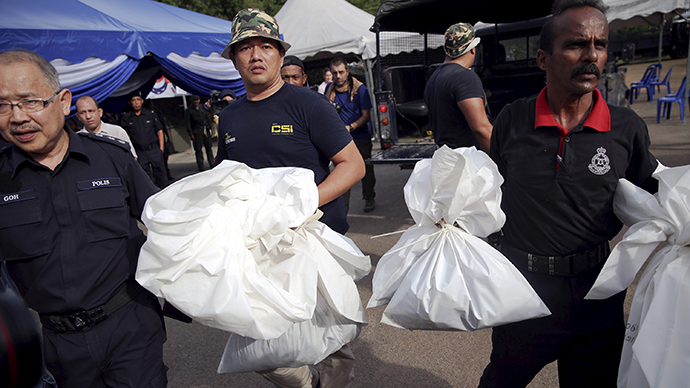 A total of 139 graves have been found in Malaysia in more than two dozen human trafficking camps believed to have been used by gangs smuggling migrants across the Thai border. Signs of torture were also discovered, the nation’s police chief said Monday. Describing the conditions at the 28 abandoned camps scattered along a 50 km (30 mile) stretch of the Thai border, Khalid said authorities were “shocked by the cruelty.” He added that signs of torture were also discovered, but declined to elaborate. Photos of the camp show basic wooden huts built in forest clearings. Khalid said bullet casings were found in the vicinity, and metal chains were found near some graves. The first decomposed body was brought down to a police camp set up at the foot of the mountains where the camps were found on Monday evening. Delivery of the corpse took nearly five hours, due to the rough terrain. “The body was only bones and little bit of clothing on it,” said Rizani Che Ismail, the officer in charge of the Padang Besar police department, as quoted by Reuters. He added that the cause of death was not immediately known. The jungles of northern Malaysia and southern Thailand have been a major route for smugglers bringing people to Southeast Asia by boat from Myanmar. Most of them are Rohingya Muslims, who say they are fleeing persecution. Others are from Bangladesh. Khalid said one of the grave sites was just 100 meters or so from where 26 bodies were exhumed from a grave in Thailand’s Songkhla province in early May. That discovery helped trigger a regional crisis, prompting Bangkok to launch a month-long crackdown on the camps – and leading traffickers to abandon thousands of migrants in boats in the Andaman Sea and Bay of Bengal. Traffickers ferry thousands of Rohingya Muslims through southern Thailand each year. In recent years, it has become common for them to be held in remote camps along the border with Malaysia, until a ransom is paid for their freedom. According to Reuters investigations, those ransoms range from US$1,200 to $1,800. Bangkok said on Monday that there are no more human trafficking camps left in southern Thailand following the crackdown. Earlier this month, Thailand stated that more than 50 police officers had been transferred as a result of human trafficking investigations. Malaysian police also stated that two officers were among 10 people arrested this year in similar probes. The United Nations refugee agency (UNHCR) said on Friday that some 3,500 migrants are still stranded on overloaded vessels with shrinking supplies. Thailand has said it will not allow the boats to land, though Prime Minister Prayuth Chan-ocha said on Monday that the Thai navy will help those in medical need. Meanwhile, Malaysia and Indonesia have said they will allow those still at sea to come ashore temporarily, and have ordered their navies to rescue people found adrift. Most of Myanmar’s Rohingya Muslims are stateless, living in apartheid-like conditions. Almost 140,000 were displaced in deadly clashes with majority Buddhists in 2012. They have been denied citizenship and complain of discrimination by the state. Myanmar has denied discriminating against the group.